Other Name: Quincy Delight Jones, Jr.
86 years, 1 month, 8 days old age. Quincy Jones will turn 87 on 14 March, 2020. Only 10 months, 20 days, 18 hours, 26 minutes has left for his next birthday. Quincy Jones has celebrated the total number of 86 birthdays till date. See the analysis by days count and bar graph. 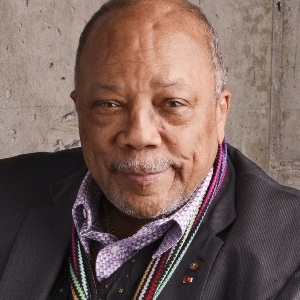 Quincy Jones was born on 14-03-1933 in Chicago in the state of Illinois, United States. He is an American Record Producer, Film Actor, Conductor, Arranger, Composer, Musician, Television Producer, Film Producer, Founder, Philanthropist, Autobiographer & Music Producer. Quincy Delight Jones, Jr., also known as "Q", a Multifaceted Man who is an American record producer, actor, conductor, arranger, composer, musician, television producer, film producer, instrumentalist, magazine founder, entertainment company executive, and humanitarian. He was born in Chicago but soon moved to Seattle and has soon developed an interest in Music. He further says that he was introduced to music by his Mother who used to sing Religious songs. He began learning Trumpet and started singing with a local gospel group. After completing his High School, he won a scholarship to Boston-based music school Schillinger House(Which later became known as Berkley School of Music). Later he moved to Paris in 1957 in order to study with Nadia Boulanger, an expatriate American composer. He is a fine Trumpeter, a terrific arranger, and composer and is recognized as one of the landmark executives of the music industry, He has earned his reputation as a legendary man of American music. Not only in Music, he has proven his talent in writing as well and has written many books. He has produced major motion pictures and helped create television series. He has spent almost seven decades of his life in Entertainment Industry and has grabbed 28 Grammys out of record-breaking 79 Grammy Award nominations. He is famous for his role in films Take it Back, Trash Talk, Fantasia 2000 and Yakety Yak. He was hired by a U.S. recording company at a senior level for the position of vice president at Mercury; this was the first time an African-American had been hired as an upper-level executive by a major U.S. recording company. Q and his songwriter partner became the first African American to be nominated for an Academy Award for Best Original Song, their “The Eyes of Love” for film Banning. He was the first African-American to be named as Musical Director and Conductor of the Academy Awards Ceremony. He was also the first African American to receive the Academy’s Jean Hersholt Humanitarian Award. Jones has been married three times; to Jeri Caldwell from 1957 to 1966 (they have one daughter), to Ulla Andersson from 1967 to 1974 (they have a son and a daughter), and to Peggy Lipton from 1974 to 1990 (they have two daughters). He also has two daughters from prior relationships.